Last night I finished sewing the straps onto my latest 1930s-style brassiere. It’s made from another reclaimed sheet, this one with a slightly looser, textured weave. I had just enough purple bias left to eke out binding and shoulder straps. And of course, it features the embroidered motifs I showed you last week. This iteration includes a few modifications from the initial version. I shifted the triangle shape ever so slightly to eliminate wrinkling under the arms. That area does lay much more flatly now, however the pattern shift also removed some of the garment’s width around the bottom, changing where the shoulder strap attaches in back. It still fits, but barely. So I’ve made a third pattern with some of the width, but not the wrinkles, added back in. Other changes include bringing the bust points slightly closer together (another factor which reduced the overall width) and eliminating the button tabs, simply sewing the buttons onto the bottom of each cup. I seem to have a one-track mind lately. When I’m not poring over historical underwear, I’m sewing modern reproductions of it. This is for another Kestos-esque brassiere. It’s positioned so that the stem will run right into the shoulder strap, and the stamens end just above the bust point. 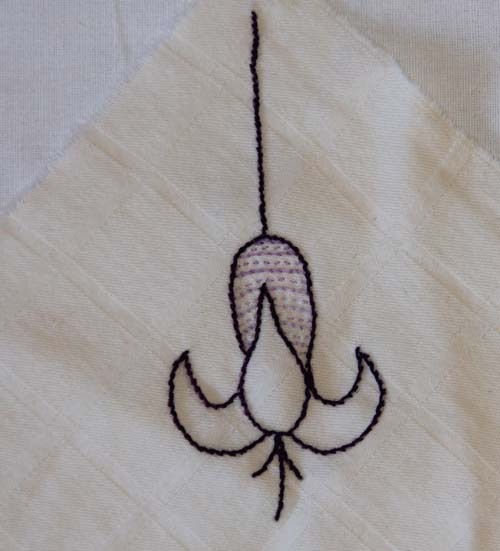 Best of all, since the fabric is cut on the bias, the flower stretches and changes shape with every breath. Of course, it’s unlikely that anyone will see it, since it is, after all, underwear. I think the stamens need little pale purple dots on each end. I considered beads, but that would be inconvenient for washing. And might look odd under a closely fitted top. After a few nights of contemplative sewing, my first prototype of the Kestos-inspired brassiere is complete. But I’m going to make you read all about how I did it before showing you a picture. 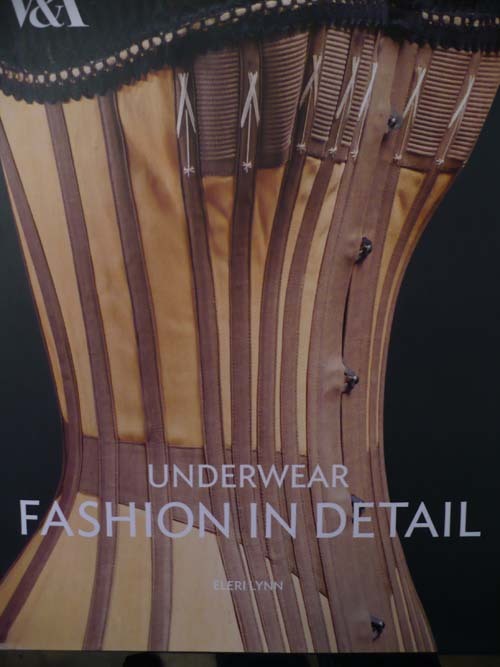 I found a photograph and description of a 1930s Kestos-style brassiere in “Underwear Fashion in Detail,” by Eleri Lynn, published by the V&A. I’d love to show it to you, but it’s probably better if I just tempt you to buy the book instead. At least a portion of the royalties must go to support the museum, so you can look at it as a charitable purchase. I will, however, go so far as to say that the text explained how the Kestos brassiere was originally conceived; it was inspired by a pair of folded handkerchiefs. So I decided to start with the same premise. I believe ladies’ hankies are usually 10 inches square (gents are 12). So I tore an 11 inch square of thick, buttery cotton (a reclaimed sheet) — 10 inches for the handkerchief, with an extra inch for seam allowances. Then I cut the square in half. The long bottom of the triangle is the base of each cup of course. Although the resulting pieces were quite malleable, being cut on the bias, they still needed a little shaping. With a half inch dart at the bottom and a quarter inch at the arm, they took on a decidedly bra-like shape. Next came the binding. I used the purple bias tape I’d cut for the petticoat that didn’t work. I’m working on incorporating more machine sewing into my process, now that I have three (count them, 1, 2, 3) sewing machines standing ever at the ready, but it’s a struggle. I did manage to sew the first side of the binding on by machine, clipping and turning neatly at the corners. 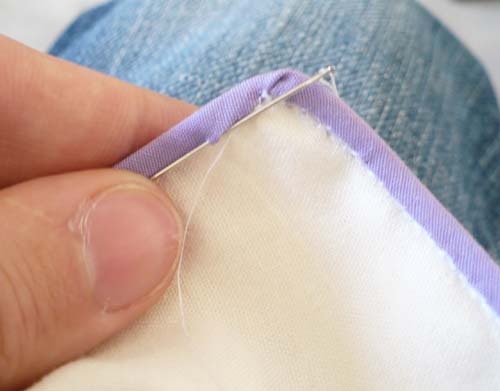 But I couldn’t resist blindstitching the folded bias on the inside by hand. There’s an hour (or three) of my life that’s never coming back. The straps were a bit tricky — I used bias (machine sewn into a tiny tube) for the shoulders and a tube of cream cotton ruched over elastic for the chest straps. Tiny shaped pieces with buttons were felled to the bottom of each cup to complete the fastening. And the back (please excuse my terrible posture, I had a camera on my left shoulder). I’m actually quite pleased with the result. It’s definitely more comfortable than anything you can buy at the local lingerie boutique. And it doesn’t rely on double-knit or endless plush elastic or underwire or foam. 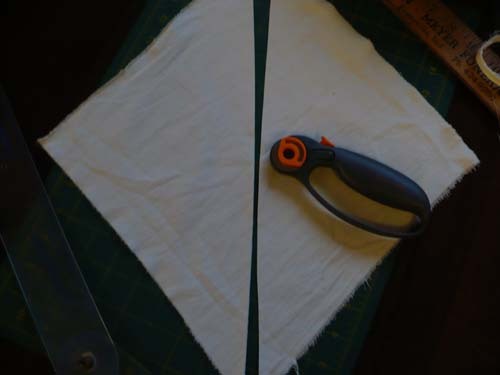 Some minor fitting issues that need correcting in Version II include shortening the shoulder straps (or making them adjustable), lengthening the back straps just a bit, and pinching a little extra material out of the sides. Oh, and Version II is going to be embroidered. Why? Just because I can. P.S. I realize it may be a bit eccentric to post pictures of myself wearing underwear on the internet. But it is definitely better than posting pictures of myself not wearing underwear. And I feel that the informative context in which it is presented must remove any objections on the grounds of taste. Lastly, this covers a sight more than my bathing suit, and I wear that to the public beaches on a regular basis.